Keeping the Sabbath, that is, setting a day apart for rest and spiritual rejuvenation, has been related to better mental health and less stress in cross-sectional studies. However, for clergy, keeping Sabbath can be complicated by needing to work on Sundays and the round-the-clock nature of clergy work. Nevertheless, numerous studies demonstrating high depression rates in clergy populations suggest clergy need to attend to their mental health. Religious denomination officials interested in preventing depression in clergy may be tempted to recommend Sabbath-keeping, although recommending other forms of rest and rejuvenation, including connecting with others, is also possible. This study examined the relationships of Sabbath-keeping as well as multiple other forms of rest and rejuvenation (vacation, sleep, relaxing activities, and social support) to mental and physical health and spiritual well-being using survey data from 1316 United Methodist clergy. Appropriate regression analyses (logistic, linear, and Poisson) were used to determine which clergy were more likely to keep the Sabbath and examined the relationships between Sabbath-keeping and multiple well-being outcomes. Receiving more social support was strongly associated with Sabbath-keeping. Sabbath-keeping was not significantly related to mental or physical health, after adjusting for covariates such as social support, although Sabbath-keeping was significantly related to higher quality of life and spiritual well-being—the original purpose of Sabbath-keeping—in clergy. To adequately test whether Sabbath-keeping could promote mental health for clergy beyond other forms of rejuvenation, intervention studies are needed. We would like to thank Gail Thomas, Crystal MacAllum, Ed Mann, and their team at Westat, Inc., for all aspects of data collection and cleaning of the Duke Clergy Health Initiative Longitudinal Survey. We thank Glen Milstein and David Eagle for their insightful comments. This study was funded by a grant from the Rural Church Area of The Duke Endowment. Adams, C. J., Hough, H., Proeschold-Bell, R. J., Yao, J., & Kolkin, M. (2016). Clergy burnout: A comparison study with other helping professions. 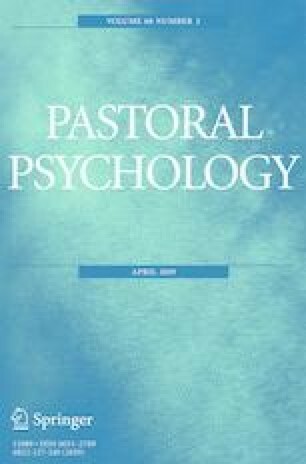 Pastoral Psychology. https://doi.org/10.1007/s11089-016-0722-4. Brooks, J. (2002). ELCA studies the health and wellness of its ministers. Evangelical Lutheran Church in America. http://www.elca.org/News-and-Events/4542. Cramer, H. (2015). The efficacy and safety of yoga in managing hypertension. Experimental and Clinical Endocrinology & Diabetes. https://doi.org/10.1055/s-0035-1565062. Duke Clergy Health Initiative. (2018). Sabbathkeeping: A Study of United Methodist Clergy in North Carolina. https://divinity.duke.edu/initiatives/clergy-health-initiative/learning. Erikson, W., & Dumoulin-Smith, A. (2009). User guide: A guide to disability statistics from the Behavior Risk Factors Surveillance System. http://digitalcommons.ilr.cornell.edu/edicollect/1263/. Evangelical Lutheran Church in America. (2016). ELCA’s benefit provider launches wellness reformation. https://www.elca.org/News-and-Events/7809. Evangelical Lutheran Church of America. (2002). ECLA studies the health and wellness of its ministers. http://www.elca.org/News-and-Events/4542?_ga=2.179528292.1723721457.1534982901-653732188.1534982901. Flick, S. (2017). John Wesley on the Sabbath. Christian Heritage Fellowship. https://christianheritagefellowship.com/wesley-on-the-sabbath/. Heavner, B. (2016). Pastor-parish relations: Connect the pastor, staff, and congregation. http://www.dukememorial.org/uploads/1/5/6/1/1561316/pastor_and_parish_relations.pdf. Hughes, B. (2017). Busy pastor, husband, dad Cliff Wall finds refreshment in Sabbath living. Sabbath Living. http://sabbathliving.org/busy-pastor-husband-dad-cliff-wall-finds-refreshment-in-sabbath-living/. Keyes, C. L. M. (2009). Brief description of the Mental Health Continuum Short Form (MHC-SF). https://www.aacu.org/sites/default/files/MHC-SFEnglish.pdf. Maykus, J. (2005). Condition: Critical: Exploring the causes of poor clergy health. Sustaining Pastoral Excellence. https://www.faithandleadership.com/programs/spe/articles/200601/critical.html. McMillan, B. R. (2003). The view from pulpit & pew: Provocative findings on pastoral leadership in the 21st century. Presentation to the Society for the Advancement of Continuing Education for Ministry. https://www.pulpitandpew.org/sites/all/themes/pulpitandpew/files/SACEM%20Keynote%20Talk1.pdf. National Heart, Lung, and Blood Institute,. (2017). Assessing your weight and health risk. https://www.nhlbi.nih.gov/health/educational/lose_wt/risk.htm. Novak, C. (2002). How healthy are our pastors? The Lutheran. http://www.thelutheran.org/article/article.cfm?article_id=4464&key=19927294, Accessed 11 February 2016. Peterson, E. H. (2018). The pastor’s Sabbath. Christianity Today.https://www.christianitytoday.com/pastors/books/prayerpersonalgrowth/lclead04-2.html. Seventh-day Adventist Church. (1990). Sabbath observance. https://www.adventist.org/en/information/official-statements/documents/article/go/-/sabbath-observance/. Stone, S. (2016). Check-in about Sabbath. Crossroads: Bethany United Methodist Church Newsletter. http://bethanysf.org/wp-content/uploads/Crossroads-October-November-2016.pdf. The Center for Health of the General Board of Pension and Health Benefits. (2015). Clergy health survey. http://xntdnn.azurewebsites.net/Portals/13/SIte%20Migration/ClergyHealthSurvey.pdf. Vitello, P. (2010). Taking a break from the Lord's work. The New York Times. https://www.nytimes.com/2010/08/02/nyregion/02burnout.html, Accessed 15 February 2016.